Museums and exhibits, there are many in London and they are always constantly changing and putting new events and exhibitions on . There are over 80 museums listed here on this site, some world famous some you will never have heard of before. But all deserve recognition and there place here. Discover them for yourself and see what you think. We have also created this handy guide to go along with this website so that you will have all the information at your fingertips whenever and where ever you are. 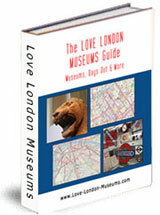 The Guide also covers other London attractions and includes maps, opening times, admission costs and where you can find discounts. To see the latest news, exhibitions and events simply click on the name of the museum below you are interested in. Discover which London Museums are open late. 0f course most museums will have their own website and all will have their own what's on section. But do you really want to have to go searching the internet for all of these individually? I'm guessing the answer is no. So I have decided to make it easier for you all by keeping my finger on the pulse and making sure that all new events, talks and exhibitions taking place at the individual museums are collated here. A sort of one stop shop for culture buffs and visitors to London who want to be kept in the know. I hope you will return often to see what's new here on Love-London-Museums.com, even better why not subscribe to this site via RSS (see buttons on the left) and then you will always be notified of any new entries.